I'm Barb Johnson, and you've entered my online spot for FuN and Whimsy. ​NOTE: Minis are NOT meant for small children, as they could present a choking hazard. Think of us as a shop for the ADULT COLLECTOR. 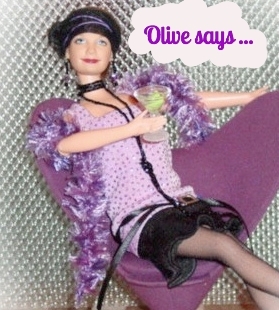 Barb J's MadWorld and the Original Olive Martini Bar are not affiliated with Mattel or any other fashion doll or action figure company. All payments must be made via PayPal. We offer a convenient PayPal shopping cart on our site and simple add-to-cart feature for your orders. The Olive Bar ships domestically via USPS. SHIPPING is ALWAYS FREE for orders over $30! Small orders will be shipped at economy rates unless priority service is requested. ​For all other International orders or expedited service, please contact us for an estimate of charges. At the Olive Bar, we stand behind the quality of our products and will offer a refund upon return of any item that proves unsatisfactory. Please contact us for instructions. All refunds will be processed via PayPal. 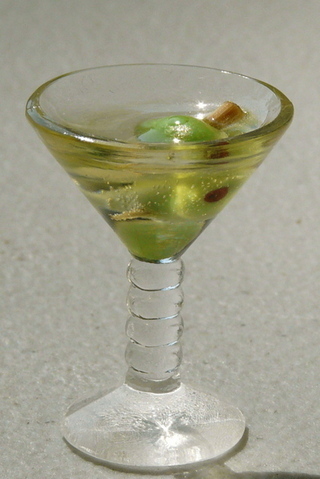 The Original Olive Martini Bar strives to be your premier source for high quality mini-drinks. We offer a basic stock of mini-martinis, cocktails and bar supplies as well as an ever-changing supply of beers, wines and champagnes . All products are as true to scale as we can manage - perfect for display with 11 1/2" Fashion Dolls and Action Figures. All of our "Specials" are done in limited production ... each one is custom-cast in acrylic resin and finished by hand. We use the highest quality materials for clarity and permanence; and for safety's sake, we will not ship products until we are satisfied that the plastics are completely cured. Our products are available from this website shop on a 24/7 basis; and they can also be purchased directly from us at local and national doll shows on an infrequent basis.